First responders are asking people who dispose of Christmas trees properly as the holiday season wraps up. INDIANAPOLIS — The holidays are coming to a close, the new year is just a couple days away and it's time to start the post-Christmas clean-up. The boxes that contained your holiday gifts are on the way out and it could be a signal to criminals, police warn. 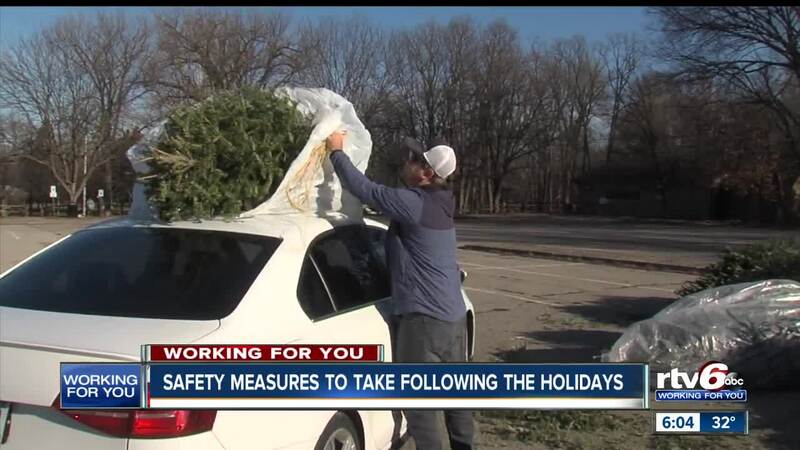 Local first responders offered up some tips for how to avoid becoming a post-holiday victim of opportunistic criminals as well as how to dispose properly of your tree now that Christmas is over. "When criminals are cruising through the neighborhoods they see those boxes by the curb, they know that you have something good inside the house so they might go up and knock on the door," Sgt. Jim Gillespie, of the Indianapolis Metropolitan Police Department, said. "If nobody's home, they may help themselves and come inside your house and take those things." So, what to do with those leftover boxes? "Go ahead and smash those down and if you have a recycling bin, collapse and put them in the recycling bin so you can't see them from the street," Gillespie said. "If you do not have a recycling bin there are several grocery stores that have recycling bins in the parking lot, so take the extra step and go ahead and haul out to a recycling bin and drop it off there." First responders are also asking people to dispose of Christmas trees correctly. "Just take the tree somewhere to a recycling location. They'll turn it into mulch," Capt. Michael Pruitt, of the Wayne Township Fire Department, said. "It will get re-used for a good purpose. We just rather see them do that then trying to burn something." Statistics show almost 25 percent of Christmas tree fires are intentional and about half of these fires happen in January. "They go up quickly and they could end up causing serious injury or damage to properties," Pruitt said.